At dawn the day after Chauncey Bailey was slain, about 200 officers from several East Bay police agencies raided the headquarters of Your Black Muslim Bakery, a longtime Oakland community institution brought low by financial ruin and allegations of violence. Arrested in that Aug. 3 raid and charged with Bailey’s murder was Devaughndre Broussard, then 19, a bakery handyman. Broussard’s arraignment for trial on the murder charge was postponed Friday until Jan. 24. His attorney, LeRue Grim — who earlier had said Broussard will testify at his own trial and identify the real killer — on Friday said Broussard is considering whether to fire him and get a new attorney. But the Aug. 3 raid wasn’t due to Bailey’s slaying; search warrants had been issued days earlier, resulting from a May 17 incident in which several men kidnapped two women at gunpoint and tortured one of them for information on the whereabouts of a convicted drug dealer’s money stash. Yusuf Bey IV, Joshua Bey and Tamon Halfin were arrested in the raid and charged with crimes connected to this earlier incident; police in October arrested and charged Yusuf Ali Bey V, 20, and Richard Lewis, 23, in connection with this crime as well. Prosecutors also filed charges later in August against Bey IV and Halfin saying they had used bogus identities to buy properties in Oakland. All five men remain behind bars; their preliminary hearing is scheduled for Jan. 24. And the shotgun allegedly used in Bailey’s slaying, recovered during the Aug. 3 raid, has been identified by police as a weapon stolen from one of two liquor stores vandalized by a group of bakery associates in 2005. Two bakery associates have pleaded guilty in that case, two more have had charges dismissed for lack of evidence, and four more — Bey IV; Donald Eugene Cunningham, 75; Khalil Ali Raheem, 26; and Dyamen Namer Williams, 21 — still face vandalism and hate crime charges. The four men’s preliminary hearing is to resume in January. 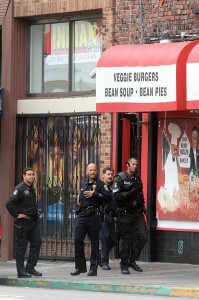 Oakland police have become reticent about the kidnapping and homicide cases, citing their desire not to undermine the work of a multi-agency task force — including their own department as well as state and federal authorities — probing the bakery’s doings. Meanwhile, Your Black Muslim Bakery essentially is no more. Bey IV had taken the business into voluntary bankruptcy in October 2006, but the bakery in following months failed to properly file reports and pay fees. On the same day police officers were kicking in the bakery’s doors, U.S. Bankruptcy Judge Edward Jellen was signing an order converting the bakery’s case to an involuntary Chapter 7 liquidation. Jellen on Nov. 29 approved sale of the bakery’s headquarters at 5832 San Pablo Ave. to a partnership buying the building on behalf of Vital Life Services, an Oakland nonprofit serving people with HIV/AIDS and other critical illnesses. The buyers say they’ll gut and renovate the building with hopes of opening their doors there April 30. The losing bidder on the property was Paulette Arbuckle, a North Oakland resident whose real estate broker was Esperanza Johnson. Formerly known as Noor Jehan Bey, Johnson is the mother of four of bakery founder Yusuf Ali Bey’s children and — with her current husband, Antron Thurman — has racked up a series of questionable real estate deals in Alameda and Contra Costa counties in which people have claimed the couple defrauded them. And the court-appointed bankruptcy trustee in October sued Bey IV’s mother, Daulet Bey, for the return of two other properties that had been owned by the bakery but were transferred to her before the bankruptcy. The trustees’ complaint says the 2004 and 2006 transfers were done with the actual intent to hinder, delay or defraud creditors of the debtor. Daulet Bey has asked for more time to respond to the complaint. – Police have said they believe bakery members were involved in the slayings of Odell Roberson Jr., 31, on July 8 and Michael J. Wills Jr., 36, on July 12, both gunned down within a few blocks of the bakery headquarters. Ballistics tests have shown the same weapon used in those slayings was used in December to shoot up a car belonging to a former boyfriend of Bey IVs wife. No arrests have been made in those slaying. – Police have also said they believe bakery members were involved in the slaying of former bakery CEO Waajid Aljawaad, 51, and the attempted slaying of former bakery associate and security manager John Bey. Aljawaad disappeared in February 2004 and his body was found months later in a shallow grave in the Oakland hills; John Bey was shot as he left his home in June 2005. – Allegations of widespread welfare fraud by the late patriarch Yusef Ali Bey and the mothers of his many children reportedly are under investigation by U.S. Department of Housing and Urban Development. The vexxing issue is of the divide between non-black and black Muslims. African Americans like Malcolm X are of the mistaken belief that Islam backs blacks. Simply put, Islam absolutely does not support blacks. Some Muslims are worse racists against blacks than Southern Confederates. It is frustrating to see how stupid they appear to non-black Islam who insults them worse than any Caucasian American would. Good riddance to this religious front for violent barbarians giving other peaceful Muslims a bad reputation. Good nutrition and eating habits has no religion.